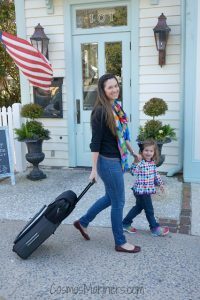 Natalie from Cosmos Mariners: Destination Unknown Travel & Lifestyle Blog recently reviewed the Demi Hugger on her website. The full article can be found here and there is also a giveaway available! “I think it should be a rule that, when you have kids, you grow at least one more arm for every kid you bring into the family. Yes, you’d probably look ridiculous with those octopus-like appendages, but let’s be honest: as a parent, you already have barf in your hair and a mysterious stain on your pants, you can’t remember where you put your keys (again), and there’s likely a small human clinging to some part of you. So, ridiculous basically becomes a relative term. In a never ending effort to find ways to make family travel easier, I am willing to try anything once. Sometimes, I come across a product that is okay, but doesn’t rock my world. But, other times, I luck up and discover something that automatically shoots to the how-did-I-live-without-this list. Read the full article and enter the giveaway here! Demi Hugger https://www.demihugger.com/wp-content/uploads/2017/10/logo-web.jpg Demi Hugger2017-03-14 21:35:132017-12-21 12:22:42Demi Hugger Reviewed by Cosmos Mariners with Giveaway! Falkanuma Palace is a must see when visiting the Hyderabad Area in India. Bike attachment for temporary storage while riding.